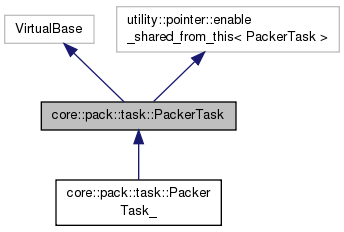 Task class that gives instructions to the packer. Referenced by protocols::task_operations::JointSequenceOperation::apply(), protocols::task_operations::ImportUnboundRotamersOperation::apply(), protocols::task_operations::LimitAromaChi2Operation::apply(), protocols::splice::SampleRotamersFromPDB::apply(), and core::pack::task::operation::AppendRotamerSet::apply(). Referenced by protocols::toolbox::rotamer_set_operations::RigidBodyMoveBaseRSO::alter_rotamer_set(), protocols::motifs::LigandMotifSearch::run(), protocols::enzdes::EnzdesBaseProtocol::setup_sequence_recovery_cache(), and protocols::task_operations::ConservativeDesignOperation::skip_resid(). Referenced by protocols::hotspot_hashing::AddSearchPatternRotSetOp::apply(), protocols::enzdes::AddRigidBodyLigandConfs::apply(), core::pack::scmin::AtomTreeCollection::AtomTreeCollection(), core::pack::rotamer_set::ContinuousRotamerSets::ContinuousRotamerSets(), core::pack::create_minimization_graph(), and core::pack::setup_bgres_cops(). Referenced by protocols::toolbox::rotamer_set_operations::RigidBodyMoveBaseRSO::alter_rotamer_set(), and core::pack::rotamers::SingleResidueRotamerLibrary::bump_filter(). Referenced by protocols::toolbox::rotamer_set_operations::AddGood2BPairEnergyRotamers::alter_rotamer_set(), protocols::minimization_packing::RotamerTrialsMinMover::RotamerTrialsMinMover(), protocols::minimization_packing::RotamerTrialsMover::RotamerTrialsMover(), protocols::rotamer_recovery::RRProtocolPackRotamers::run(), protocols::rotamer_recovery::RRProtocolRotamerTrials::run(), protocols::rotamer_recovery::RRProtocolRTMin::run(), core::pack::interaction_graph::SurfaceInteractionGraph< V, E, G >::set_packer_task(), core::pack::interaction_graph::NPDHBondInteractionGraph< V, E, G >::set_packer_task(), core::pack::interaction_graph::HPatchInteractionGraph< V, E, G >::set_packer_task(), and protocols::pack_daemon::PackDaemon::set_pose_and_task(). Referenced by protocols::enzdes::DetectProteinLigandInterface::apply(), protocols::enzdes::ProteinLigandInterfaceUpweighter::apply(), protocols::toolbox::IGLigandDesignEdgeUpweighter::get_edge_reweight(), and protocols::enzdes::EnzdesFlexBBProtocol::modified_task(). Referenced by protocols::symmetric_docking::SymRestrictTaskForDocking::apply(), and protocols::rotamer_recovery::RRProtocolMinPack::run(). Referenced by protocols::task_operations::ModifyAnnealer::apply(), and protocols::optimize_weights::ScaleAnnealerTemperatureOperation::apply(). Referenced by protocols::enzdes::EnzdesFlexBBProtocol::modified_task(), protocols::enzdes::enzutil::recreate_task(), and core::pack::interaction_graph::InteractionGraphFactory::setup_IG_res_res_weights(). Referenced by core::pack::rotamer_set::RotamerSet_::build_filtered_tp3_water_rotamers(), core::pack::rotamer_set::build_rna_rotamers(), core::pack::rotamer_set::RotamerSet_::build_rotamers_for_concrete(), core::pack::rotamer_set::RotamerSet_::build_tp3_water_rotamers(), core::pack::rotamer_set::RotamerSet_::build_virtualizable_rotatable_water_rotamers(), core::pack::rotamers::SingleResidueRotamerLibrary::current_rotamer(), protocols::rotamer_recovery::RRProtocolRotamerTrials::run(), and protocols::rotamer_recovery::RRProtocolRTMin::run(). Referenced by core::pack::task::operation::EnableMultiCoolAnnealer::apply(), and core::pack::task::operation::UseMultiCoolAnnealer::apply(). Referenced by protocols::symmetric_docking::SymRestrictTaskForDocking::apply(), core::pack::task::operation::OptH::apply(), and core::pack::task::operation::InitializeFromCommandline::apply(). Has this PackerTask been initialized with a PackerPalette? PackerTasks must be initialized with PackerPalettes before being modified with TaskOperations. The TaskFactory will initialize the PackerTask with a DefaultPackerPalette if no custom PackerPalette is provided. Referenced by core::pack::rotamer_set::build_rotated_water_rotamers(), and core::pack::rotamers::SingleResidueRotamerLibrary::bump_filter(). Referenced by protocols::task_operations::SelectByDensityFitOperation::apply(), protocols::task_operations::SelectBySASAOperation::apply(), protocols::task_operations::SelectByDeltaScoreOperation::apply(), protocols::dna::RestrictDesignToProteinDNAInterface::apply(), protocols::task_operations::RestrictNonSurfaceToRepackingOperation::apply(), protocols::hbnet::ConstrainHBondNetwork::apply(), protocols::task_operations::InteractingRotamerExplosion::apply(), core::pack::task::operation::FillAUTOTaskOperation::apply(), protocols::enzdes::SetCatalyticResPackBehavior::apply(), protocols::matdes::BuildingBlockInterfaceOperation::apply(), protocols::task_operations::CrystalContactsOperation::apply(), protocols::task_operations::ConservativeDesignOperation::apply(), protocols::task_operations::RestrictIdentitiesOperation::apply(), core::pack::task::operation::ReplicateTask::apply(), protocols::task_operations::RestrictToTerminiOperation::apply(), core::pack::task::operation::OperateOnCertainResidues::apply(), protocols::task_operations::ResidueProbDesignOperation::apply(), protocols::task_operations::RestrictNativeResiduesOperation::apply(), protocols::task_operations::MutationSetDesignOperation::apply(), core::pack::task::operation::OperateOnResidueSubset::apply(), core::pack::task::operation::NoRepackDisulfides::apply(), protocols::task_operations::JointSequenceOperation::apply(), core::pack::task::operation::RestrictToSpecifiedBaseResidueTypes::apply(), core::pack::task::operation::ClashBasedRepackShell::apply(), core::pack::task::operation::OptH::apply(), protocols::task_operations::SeqprofConsensusOperation::apply(), protocols::simple_task_operations::DockingNoRepack1::apply(), protocols::hotspot_hashing::AddSearchPatternRotSetOp::apply(), protocols::enzdes::DetectProteinLigandInterface::apply(), protocols::simple_task_operations::DockingNoRepack2::apply(), core::pack::task::operation::ProhibitSpecifiedBaseResidueTypes::apply(), core::pack::task::operation::DesignRestrictions::apply(), protocols::task_operations::DsspDesignOperation::apply(), core::pack::task::operation::RestrictToResidueProperties::apply(), protocols::simple_task_operations::RestrictToInterface::apply(), protocols::task_operations::RestrictConservedLowDdgOperation::apply(), core::pack::task::operation::ProhibitResidueProperties::apply(), protocols::flxbb::LayerDesignOperation::apply(), protocols::enzdes::AddRigidBodyLigandConfs::apply(), core::pack::task::operation::RestrictResidueToRepacking::apply(), core::pack::task::operation::RestrictAbsentCanonicalAAS::apply(), core::pack::task::operation::DisallowIfNonnative::apply(), core::pack::task::operation::RotamerExplosion::apply(), core::pack::task::operation::ExtraRotamersGeneric::apply(), core::pack::task::operation::AppendResidueRotamerSet::apply(), core::pack::task::operation::PreventRepacking::apply(), core::pack::task::operation::RestrictYSDesign::apply(), core::pack::task::operation::ExtraRotamers::apply(), core::pack::task::operation::ExtraChiCutoff::apply(), protocols::denovo_design::task_operations::ConsensusLoopDesignOperation::disallow_aas(), core::pack::task::NATRO::residue_action(), core::pack::task::NATAA::residue_action(), core::pack::task::ALLAAxc::residue_action(), core::pack::task::PIKAA::residue_action(), core::pack::task::PIKNA::residue_action(), core::pack::task::NOTAA::residue_action(), core::pack::task::PROPERTY::residue_action(), core::pack::task::POLAR::residue_action(), core::pack::task::APOLAR::residue_action(), core::pack::task::CHARGED::residue_action(), core::pack::task::AROMATIC::residue_action(), core::pack::task::EX::residue_action(), core::pack::task::EX_CUTOFF::residue_action(), core::pack::task::USE_INPUT_SC::residue_action(), core::pack::task::AUTO::residue_action(), core::pack::task::SCAN::residue_action(), core::pack::task::TARGET::residue_action(), core::pack::task::NO_ADDUCTS::residue_action(), core::pack::task::FIX_HIS_TAUTOMER::residue_action(), protocols::motifs::LigandMotifSearch::run(), protocols::minimization_packing::EnergyCutRotamerTrialsMinMover::setup_energycut_task(), protocols::minimization_packing::EnergyCutRotamerTrialsMover::setup_energycut_task(), and protocols::simple_task_operations::RestrictToInterface::symmetric_task(). Referenced by core::pack::rotamer_set::ContinuousRotamerSets::ContinuousRotamerSets(), core::pack::interaction_graph::InteractionGraphFactory::create_interaction_graph(), core::pack::repackable_residues(), and core::pack::repackable_residues_dup(). Activates the DoubleLazyInteractionGraph, which computes rotamer pair energies at most once, and delays allocating memory to hold them until needed. Used for multistate design. Referenced by protocols::symmetric_docking::SymRestrictTaskForDocking::apply(), core::pack::task::operation::OptH::apply(), and core::pack::task::operation::IncludeCurrent::apply(). Activate a LazyInteractionGraph that computes rotamer pair energies at most once. Activate a LinearMemoryInteraction graph that uses 95% less memory in design runs and runs twice as fast. (Not faster for fixed-sequence repackings). Referenced by core::pack::task::operation::EnableMultiCoolAnnealer::apply(), core::pack::task::operation::OptH::apply(), and core::pack::task::operation::UseMultiCoolAnnealer::apply(). Referenced by protocols::dna::RestrictDesignToProteinDNAInterface::apply(), protocols::enzdes::DetectProteinLigandInterface::apply(), core::pack::rotamer_set::build_dna_rotamers(), core::pack::rotamer_set::build_moving_O_water_rotamers_dependent(), core::pack::rotamer_set::build_moving_O_water_rotamers_independent(), protocols::flexpack::rotamer_set::FlexbbRotamerSet::bump_check(), core::pack::rotamer_set::bump_check(), protocols::nmr::bump_check(), core::pack::rotamers::SingleResidueRotamerLibrary::bump_check(), core::pack::rotamer_set::RotamerSet_::bump_check(), core::pack::rotamer_set::RotamerSet_::compute_one_and_two_body_energies(), core::pack::rotamer_set::symmetry::SymmetricRotamerSet_::compute_one_body_energies(), core::pack::rotamer_set::RotamerSet_::compute_one_body_energies(), protocols::hbnet::hbnet_symm_one_body_energies(), protocols::enzdes::EnzdesFlexBBProtocol::modified_task(), protocols::backrub::positions_incompatible_with_task(), core::pack::rotamer_set::pre_bump_check(), core::pack::repackable_residues(), core::pack::repackable_residues_dup(), protocols::rotamer_recovery::RRProtocolMinPack::run(), protocols::rotamer_recovery::RRProtocolPackRotamers::run(), protocols::rotamer_recovery::RRProtocolRotamerTrials::run(), protocols::rotamer_recovery::RRProtocolMover::run(), protocols::rotamer_recovery::RRProtocolRelax::run(), protocols::rotamer_recovery::RRProtocolRTMin::run(), protocols::rotamer_recovery::RRProtocolReferenceStructure::run(), and core::pack::symmetric_repackable_residues(). Referenced by core::pack::rotamer_set::UnboundRotamersOperation::alter_rotamer_set(), protocols::toolbox::rotamer_set_operations::RigidBodyMoveBaseRSO::alter_rotamer_set(), protocols::splice::SampleRotamersFromPDB_RotamerSetOperation::alter_rotamer_set_from_db(), protocols::splice::SampleRotamersFromPDB_RotamerSetOperation::alter_rotamer_set_from_pdb(), protocols::dna::RestrictDesignToProteinDNAInterface::apply(), protocols::task_operations::MutationSetDesignOperation::apply(), protocols::enzdes::DetectProteinLigandInterface::apply(), protocols::flxbb::LayerDesignOperation::apply(), core::pack::scmin::AtomTreeCollection::AtomTreeCollection(), core::pack::rotamer_set::RotamerSet_::build_dependent_rotamers(), core::pack::rotamer_set::build_dna_rotamers(), core::pack::rotamer_set::RotamerSet_::build_optimize_H_rotamers(), core::pack::rotamer_set::build_rna_rotamers(), core::pack::rotamer_set::ContinuousRotamerSet::build_rotamers(), core::pack::rotamer_set::RotamerSet_::build_rotamers(), core::pack::rotamer_set::RotamerSet_::build_rotamers_for_concrete(), core::pack::dunbrack::RotamericSingleResidueDunbrackLibrary< T, N >::create_rotamers_from_chisets(), protocols::calc_taskop_movers::ConsensusDesignMover::create_sequence_profile_constraints(), protocols::denovo_design::task_operations::ConsensusLoopDesignOperation::disallow_aas(), core::pack::dunbrack::RotamericSingleResidueDunbrackLibrary< T, N >::enumerate_chi_sets(), core::pack::rotamers::SingleBasicRotamerLibrary::fill_rotamer_vector(), core::pack::rotamers::SingleLigandRotamerLibrary::fill_rotamer_vector(), core::pack::dunbrack::cenrot::SingleResidueCenrotLibrary::fill_rotamer_vector(), protocols::enzdes::EnzdesFlexBBProtocol::modified_task(), protocols::backrub::positions_incompatible_with_task(), protocols::enzdes::enzutil::recreate_task(), core::pack::task::POLAR::residue_action(), core::pack::task::APOLAR::residue_action(), core::pack::task::CHARGED::residue_action(), core::pack::task::AROMATIC::residue_action(), core::pack::rotamer_set::RotamerSet_::set_extra_samples(), and core::pack::rotamers::SingleResidueRotamerLibrary::virtual_sidechain(). Referenced by protocols::symmetric_docking::SymRestrictTaskForDocking::apply(), core::pack::task::operation::RestrictToRepacking::apply(), protocols::minimization_packing::EnergyCutRotamerTrialsMover::setup_energycut_task(), and protocols::minimization_packing::EnergyCutRotamerTrialsMinMover::setup_energycut_task(). Referenced by protocols::task_operations::RestrictByCalculatorsOperation::apply(), protocols::task_operations::RestrictToInterfaceOperation::apply(), protocols::task_operations::RestrictToNeighborhoodOperation::apply(), protocols::task_operations::RestrictToInterfaceVectorOperation::apply(), and protocols::task_operations::RestrictInterGroupVectorOperation::apply(). Referenced by protocols::dna::WatsonCrickRotamerCouplings::apply(), core::pack::task::operation::SetRotamerCouplings::apply(), and core::pack::rotamer_set::build_dna_rotamers(). Referenced by protocols::forge::remodel::RemodelRotamerLinks::apply(), protocols::task_operations::LinkResidues::apply(), and core::pack::task::operation::SetRotamerLinks::apply(). Referenced by protocols::pack_interface::ProteinProteinInterfaceUpweighter::apply(), and protocols::enzdes::ProteinLigandInterfaceUpweighter::apply(). Referenced by protocols::denovo_design::task_operations::ConsensusLoopDesignOperation::apply(), and core::pack::task::operator<<(). Referenced by core::pack::rotamer_set::UnboundRotamersOperation::alter_rotamer_set(), protocols::dna::RestrictDesignToProteinDNAInterface::apply(), core::pack::task::operation::FillAUTOTaskOperation::apply(), core::pack::task::operation::OperateOnCertainResidues::apply(), core::pack::task::operation::OperateOnResidueSubset::apply(), core::pack::task::operation::RestrictAbsentCanonicalAAS::apply(), core::pack::task::operation::DisallowIfNonnative::apply(), core::pack::task::operation::ExtraRotamersGeneric::apply(), core::pack::task::operation::ReadResfileAndObeyLengthEvents::apply(), protocols::denovo_design::task_operations::ConsensusLoopDesignOperation::disallow_aas(), protocols::forge::methods::parse_resfile_string_with_no_lockdown(), protocols::backrub::positions_incompatible_with_task(), protocols::enzdes::enzutil::recreate_task(), core::pack::repackable_residues(), core::pack::repackable_residues_dup(), core::pack::task::operation::ReadResfileAndObeyLengthEvents::resfile_commands(), protocols::pack_daemon::PackDaemon::set_pose_and_task(), and core::pack::symmetric_repackable_residues().